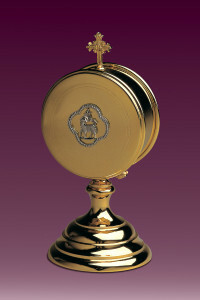 Custodial is a liturgical vessel constantly used in the Catholic Church. It resembles a box supported on a leg and is used for the storage of the Holy Sacrament in the tabernacle. 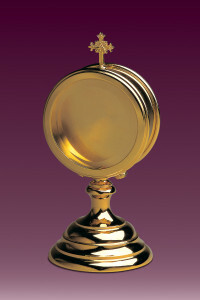 The Host, which is intended for adoration, is placed in the custodial. Then the Host is inserted into the monstrance and carried back to a special container. In Sacrum bronze workshop, we have an extremely wide range of liturgical vessels to offer which are characterised by durability and certainly stand out thanks to the aesthetics of their manufacture. Sacrum provides Customers with an enormous selection of ecclesiastical objects which are finished by means of different types and designs of decorations. This is to be a response to the needs and expectations of buyers. More custodial see in page kustodia.